The eight-foot tall, larger-than-life sculpture “holds its own” in the space it occupies between the Bloch Heritage Hall and Bloch Executive Hall at the University of Missouri-Kansas City. Eugene Daub, a nationally celebrated sculptor, created the Henry W. and Marion Bloch sculpture larger than normal – called “life and a half” – to match the scale of the outdoor space where it was installed. The space was carefully selected by the sculptor, the design team and the Bloch family to not just bridge the old and new buildings, but create a natural gathering place for students. The strategically placed opening between Henry and Marion allows a glimpse of the surrounding community and illustrates the Blochs’ love and dedication to both the university and the community. Daub was selected because of the Lewis and Clark statue he previously constructed, which is located in downtown Kansas City. He later created the Corps of Discovery statue that also is in downtown Kansas City. Daub and his partner, Dr. Rob Firmin, were celebrated earlier this year for the commemorative Rosa Parks sculpture that was placed in the U.S. Capitol Art Collection. The Bloch sculpture was commissioned approximately one year ago by the Bloch children to surprise their father on his 90th birthday and to commemorate their parents’ commitment to the Bloch School and to the city. The work was constructed in sections and then assembled at the foundry where a wax mold was made. Once approved, the final product was created in bronze. 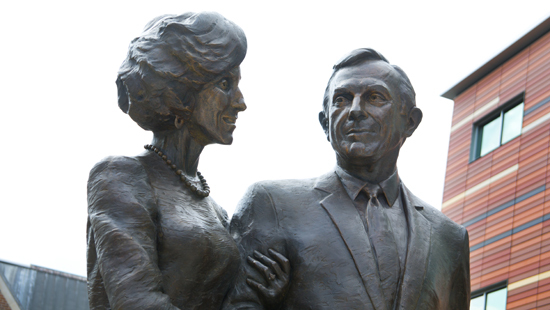 “Dad, please know your children and grandchildren for generations will be able to walk past that statue and be reminded of our love for you and Mom and all that you’ve represented and done for Kansas City, UMKC and the Bloch School,” said Tom Bloch. He spoke on behalf of his brother and sisters on the evening of the unveiling. Tags: Bloch School of Management, eugene daub, Henry W. Bloch, marion bloch, sculptor, sculpture, UMKC.